In this post, I want to give you 10 analytics tactics that you can use right away to drastically improve your product marketing efforts. These hacks are things that I see companies get wrong all the time but can be easily fixed. Where should I spend my marketing dollars? How do I improve the user retention? How can I fix leaky funnels before users sign up? Google Analytics: almost every startup uses it in some way or another. GA is great at answering marketing related questions. Mixpanel: an event based tool that is really good at helping you segment your data, funnel analysis and user retention. Mixpanel popular among mobile apps and web apps for everything that happens after a user signs up. You could also apply these tactics to similar tools. For example, Kissmetrics/Amplitude/Woopra are similar to Mixpanel while Pwiki/Hotjar are similar to Google Analytics. Related: We have created a free video course that will teach you everything you need to know about Amplitude. You can view the Ultimate Guide on Amplitude Analytics here. Finally, these tactics follow a sequential order meaning that each one builds on what you the previous one. This post is almost 3500 words so I also provided a handy table of contents if you want to skip a few tactics. Analytics frameworks like AARRR will give you a model to easily understand how different metrics play together. They will also help you prioritize what areas of your product marketing to focus on. After all, there’s no point in trying to improve your user retention if you barely have any users signing up. You logically start by acquiring users until you have enough to then focus on activating them and then retaining them. This doesn’t mean that you need to acquire thousands of users but enough to let you fully understand the next steps. Under each step, you will have different metrics that matter to your company. It’s hard to find a set of universal metrics for all startups so these will vary for each company There are also other frameworks like the Startup Pyramid by Sean Ellis and Lean Analytics Stages. Choose the framework that makes the most sense to you. As mentioned before, Google Analytics is really good at the first step in this framework, Acquisition. The one thing you need to set up in GA (besides adding the tracking code to your product) is to create a “Goal” to track the signup conversion. 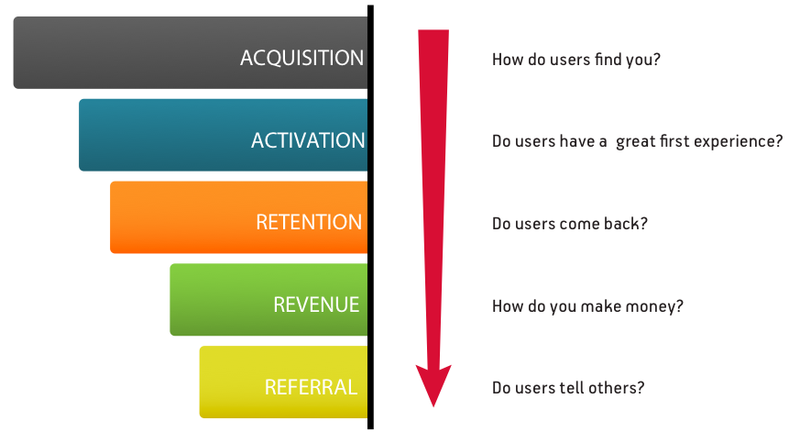 This is when users go from Acquisition to the Activation step. To do that, go to the “Admin” section of GA and then find the correct account and the correct property. In the far right, you will have “Views” and just under that, “Goals”. Choose the right category for your goal and then press “Continue”. You are then given a few options for how to measure this goal. If you have a dedicated destination page for your users after they complete the goal e.g. a thank you page, then use that. You can finish by saving your goal. You can now use this goal to segment your Google Analytics data like in the image below, where I’m segmenting my traffic sources by a newsletter signup goal. Once you have a goal set up, you could use it to optimize your Facebook Ads for example. Before Mixpanel can send you any data, you need to send events to it. I’m covering how to send events on a different tactic below but let’s imagine how you would set up the remaining steps of AARR in Mixpanel. You need an event that gets fired when users get “activated”. This might mean that they complete the onboarding process or that they have taken certain actions. You could then create a funnel showing how many users sign up for your product and then get activated. This gives you a quick overview of your conversion rates from the Acquisition step to the Activation step. You can see the drop off in usage as the days increase. You want to work to reduce this drop off and retain more of your users. The last step in this framework, Referral, is a bit tricky to track with Mixpanel. You could have events that fired when users referred other users but it won’t be perfect. A dedicated tool for referrals will be much better. Startups have this burning desire to track everything. Maybe this is variation of the popular FOMO. Anyway, this is the wrong approach to take when you’re just starting out your product marketing strategy. Easier to implement: If you’re implementing the events yourself, it will be faster to only do a handful to begin with. This means your developers can get back to working on your product much quicker. Easier to debug: Almost all analytics implementations will have bugs that affect the data. Tracking and fixing issues on a handful of metrics is easier than doing it on 20-30 metrics. More focus: instead of trying to improve 20 metrics, half of which may not be that important right now, you can focus on improving the metrics that do matter. The goal here is to start improving important parts of our product marketing, not every possible area. I’ll go into more detail on how to create these GA dashboard and how to use existing templates in a tactic below. For Mixpanel, you need to figure out which events you actually need to track. You can do this by translating your key metrics into events. For example, let’s say that you want to look at signups. This can be tracked by using one event “Sign Up”. However, some of your metrics may be more complex like user retention. For this metric, you might need 3 events which cover the different actions that users must take in your product before they are considered “retained”. The next tactic goes deeper into events and properties, two core concepts that will help you properly setup tools like Mixpanel. Tools like Mixpanel function exclusively on events while tools like Google Analytics use a combination of events and page views. You then fire this event when a user successfully submits a form. No need to track any optional values in this event. We can see that the event is called “Registered” and we are also sending two properties: Gender and Age. Properties are really powerful concept in Mixpanel because that’s where you can store all the details about that event. Mixpanel even has ways to track clicks on links and form submissions, two common actions that your users will take. To organize all your events and properties, you also need a tracking plan which is our next tactic. Analytics tracking plans are excel documents where you can document all of your events and properties. It’s a simple document that will save you a lot of time and frustration. All of these issues can be fixed with a tracking plan. If you start by implementing your analytics events directly into your code, you will end up with duplicated efforts. Related:You can download the same tracking plan that I use with my own clients. There’s two formats: Google Sheets (my preference) and Excel. Planning this out in Excel will make it easier to condense similar events and to reuse the same property names across different events. Tracking plans also function as an onboarding tool for new team members. They can use the tracking plan to reference what events should exist instead of having to go through your web analytics tool looking at each event one by one. You can event store your GA events alongside your Mixpanel events while keeping this structure. The properties for Mixpanel are defined by you so keeping track of what properties you have used in previous events is crucial. You also need to track any special people properties and super properties which are properties that get applied to all events. Consistency: use the same naming scheme for all of your events and properties. There’s no right or wrong naming scheme so if you want to use past tense camelCase e.g. “SignedUp”, then that’s fine. Just use the same thing everywhere. Easy to Read: Your events and properties should be easy to read, especially for non-technical people. I seen events that have some kind of cryptic naming scheme like “xxzzSignUpzz”. I’m sure this naming scheme makes sense to whoever came up with it but it doesn’t to the new marketing team member. Apart from the tips above, reuse certain event properties in GA. For example, “Event Category” is a property that is meant to be reused across different events. Remember that these values are case sensitive so “Homepage” and “homepage” are two different things to GA.
Naming schemes are crucial for Mixpanel. If you aren’t sure if your naming scheme is easy to read, open the “Live View” in Mixpanel and expand on one of your events. Anyone should be able understand all of these properties at a glance without having to guess what they mean. Don’t use the wrong tools. Obvious when you think about it but I see companies do this all the time. For example, they might try to use Mixpanel for analyzing marketing spending (Mixpanel is not meant for that). It works but not very well. What are they pitching in their website? What industries are they talking about? What are other companies using it for? What are they known for from their customers? If you still can’t figure it out, email them! The will tell you what they are really good for. If a tool tells you that they can do everything, I would be worried. What is Google Analytics Good For? It comes down to the difference between pageviews and events, which I covered in a previous post. What is Mixpanel Good For? With so many options for analytics tools, you may be wondering how to easily test them all. The answer is to use a wrapper like Segment, which sits on top of your analytics tools. You would then send your events to Segment (using their libraries) and they will translate them into tool specific events like Mixpanel. This means that you can easily swap out your Mixpanel implementation for Kissmetrics without having to rewrite your event code. You can also just send your event data to a warehouse like your own Postgres database. Segment also functions as a tag manager just like Google Tag Manager (GTM). Tag managers make it easier to deploy event code and other marketing pixels without having to commit new code. You simply add the tracking code for the tag manager to your product and then use the GTM interface to add new snippets of code. You could even use GTM and Segment together, making it easier for frontend developers and marketers to add new events. Google Tag Manager is designed to work well with Google Analytics especially when it comes to sending events. You can easily create a new tag that uses Google Analytics as the product and then choose to send an “Event”. You are then presented with the typical options for GA events. City ($city) – The city of the event sender, parsed from IP. Region ($region) – The region (state or province) of the event sender, parsed from IP. Country (mp_country_code) – The country of the event sender, parsed from IP. Browser ($browser) – Browser name (not versioned). Browser Version ($browser_version) – Browser version number. Device ($device) – The name of the event sender’s device, if they’re on mobile web. Current URL ($current_url) – The full URL of the webpage on which the event is triggered. Initial Referrer ($initial_referrer) – Referring URL at first arrival. Initial Referring Domain ($initial_referring_domain) – Referring domain at first arrival. Operating System ($os) – OS of the event sender. Referrer ($referrer) – Referring URL, including your own domain. Referring Domain ($referring_domain) – Referring domain, including your own domain. Screen Height ($screen_height) – The height of the screen of the device. Screen Width ($screen_width) – The width of the screen of the device. Search Engine ($search_engine) – Search engine a customer used when they arrived at your domain. UTM Parameters (utm_source, utm_medium, etc.) – Any utm tags associated with the link a customer clicked to arrive at your domain. Each utm will be collected under its own property. You can learn more about the different libraries for Mixpanel here. Another common mistakes that I see companies do is that they have no goals or baselines that they are working towards. If you’re trying to improve you signup conversion rate, what is your goal? How do you know when this metric is “good enough”? You may think that you will simply continue to improve this conversion rate forever but you don’t have that much time. You need to prioritize where to spend your energy and you should be spending your energy where your efforts can have some serious impact. The final tactic is to use automated reports and dashboards for your key metrics. You should be able to check your progress on your metrics within a few clicks and so should the rest of your team. You can then just bookmark these reports and check them on a regular basis. While there’s a dedicated dashboard tools like Cyfe and Klipfolio, you can also do this within GA and Mixpanel. GA lets you create dashboards by clicking the “Dashboards” menu option on the left hand side and then clicking “New Dashboard”. You can manually create your dashboard or choose to “Import from Gallery” which will let you pick pre-existing templates. The second option is my recommendation since you can find nearly all metrics already put together into dashboards. In Mixpanel, you want to take advantage of “Bookmarks”. Once you have your report (query) ready, you can click the plus icon in the top right next to the words “Bookmarks” to create a new saved report. You can then easily load this bookmark to see this exact report. You can also save this report as a browser bookmark and come back to it whenever you need to. I would to hear what you think about these tactics. You can message me on Twitter @ugarteruben.